Simon Benson writing in the Oz, commenting on Newspoll, said the Morrison’s big task was to spread his popularity to the rest of the party. You see, apart from a landslide losing position, ScoMo returned a positive personal rating. A total of 43 per cent of voters think he’s doing a good job, against 42 per cent who think he’s not. Shorten’s figures are 37-50, but still, Morrison does not have much popularity to spread. Psephologists like Kevin Bonham say that there is no established connection between personal ratings and election outcomes, but apart from Turnbull’s mantra of ‘jobs and growth’ then ‘kill Bill’ is about all ScoMo has got. That’s while his party seems to be falling apart. First cabinet minister Kelly O’Dwyer told colleagues during a crisis meeting of federal Victorian MPs the Liberals are widely regarded as “homophobic, anti-women, climate-change deniers”. She got that a bit wrong, she should have deleted the phrase “widely regarded as”, but it was a moment of plain-speaking honesty. Later she sparked guffaws when she claimed the Liberal government was the “natural government for Australian women”. Now a union commissioned ReachTel poll finds that voters in her seat of Higgins favoured Labor 53-47. True, names weren’t mentioned, so her personal magnetism might win out. Ms Banks excoriated the “reactionary right wing” within the Coalition for its role in toppling Malcolm Turnbull as prime minister, and praised the “sensible centrist Liberal values” of colleagues like Julie Bishop. 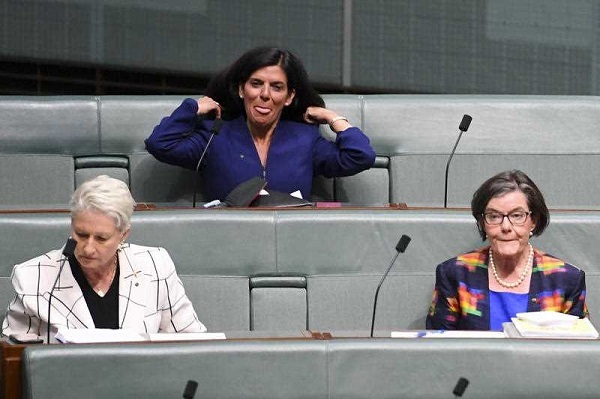 Newly Independent MP Julia Banks (centre) takes seat on the cross bench during House of Representatives Question Time. Ms Banks announced her decision in the House of Reps chamber on Tuesday, just as prime minister Scott Morrison was on live television on the other side of Parliament House, announcing the date of the 2019 Budget. 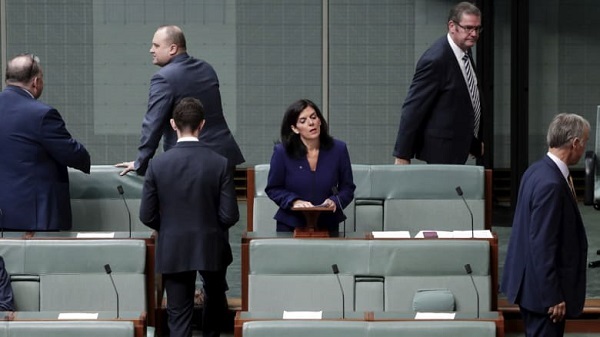 The resignation follows a string of Liberal women criticising the party for a culture that permitted bullying and stand-over tactics, particularly during the recent leadership spill. If the Liberal Party is to regenerate, some truth-telling from sensible liberals will be a necessary condition. But here’s where we get to the Liberals’ second “women problem” — the double standards that lets Banks and other malcontents use gender wars as an excuse for bad behaviour. Banks is now hailed in the media as an example of the Liberals mistreating their women, when she’s actually an appalling example of their woman mistreating the Liberals. That’s one way of blaming the victim. Michelle Grattan points out that Banks did not inform Morrison of her intention, which Grattan puts down to his authority deficit at home and abroad. She points out that Morrison has no scheduled meeting with Donald Trump at the forthcoming G20 meeting. She thinks they won’t waste their time, and will wait to see who is in the chair next May. 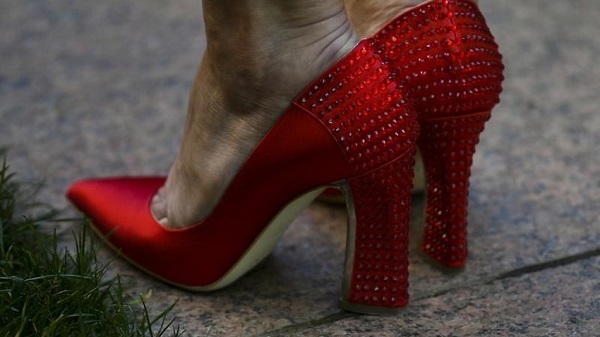 I divert to mention the business of red shoes, which Ambigulous commented on the other day. 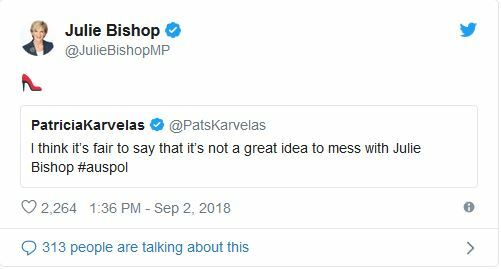 I suspect Ms Bishop is letting her colleagues know she’s around, should they need a different leader. Back to ScoMo and more particularly, what the man is made of. Eddy Jokovich has taken a look in The unknown Scott Morrison. Insiders who worked in the marketing department at the time have mentioned to me that Morrison’s performance was poor, he spent most of his time on Liberal Party business matters, was rarely seen in the office and seemed to do very little work – and then, all of a sudden, he was gone, his office cleaned out, never to be seen at Tourism Australia again. Worse was to come when Morrison ran for preselection and lost 82-8 to Michael Towke, on paper a far more credentialed candidate. Based on his performance as prime minister over the past three months, and his history in the public arena, Morrison is the consummate anti-intellectual and is guided solely by personal pursuit and power. responding to Pamela Anderson’s call for the prime minister to lend support for the return of Julian Assange to Australia, Morrison joked: “I’ve had plenty of mates who have asked me if they can be my special envoy to sort the issue out with Pamela Anderson”. And ever so close to White Ribbon Day, a global movement to end violence against women and girls. I’ve tended to think of Morrison as a bear with very little brain, and a mouth that flaps almost at random. Whatever you think of Jokovich’s account, the preselection event is a matter of public record, and should disqualify Morrison from sitting in parliament in a just world. Along the way we find that only 75% of Australians know who Morrison is, as against 70% for Peter Dutton and 82% for Julie Bishop. Much of the article is devoted to Julie Bishop’s aspirations to the Liberal leadership. She has given comfort to Julia Banks and others, stated that Peter Dutton really does have to clarify his eligibility, and, in what would be seen as an act of betrayal by some, has suggested that the Government should sit down with Labor and work out a bipartisan approach to the National Energy Guarantee. There is chatter about the Bishop option around the traps, with some enthusiasm and some saying another leadership change would be “beyond ridiculous”. The point here is that far from Labor’s target of 50% renewables by 2030 being beyond limits and “economy-wrecking” as asserted by ScoMo and Angus Taylor, you would have to wreck the renewables industry to avoid 50% and more. So politics in the next six months is bound to be interesting. We have in place an accidental PM who, it seems, is willing to do about anything it takes to prevent Labor from winning office, because his brand of politics regards Labor as illegitimate in our political system. Bishop at least presents as a leader who recognises Labor’s legitimacy, and is probably the best chance to restore some decency to the whole political process. That is, if there are enough sensible people left in the Liberal Party to give her a go. There may be other options, but she’s about more than red shoes and is worth watching every move she makes. Update: The bottom line for me was that at first I thought ScoMo was an amiable enough fellow, somewhat empty headed but essentially harmless. Now it seems he can be genuinely nasty and dangerous. Update 2: Andrew Welder’s Enough, enough enough presents a portrait of Morrison perhaps even darker than the one presented by Jokovich. Of interest he notes that pentacostalist churches in the US strongly support Trump’s relocation of the US embassy to Jerusalem. Welder says Morrison lacks the wit and the clout to simply draw a line under this issue. 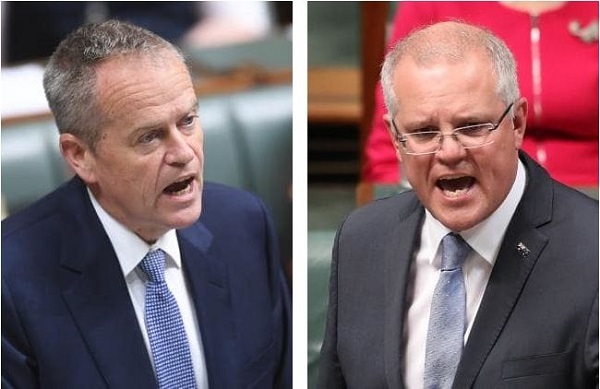 Both the power dynamics within the Liberal Party (the right must be seen to have a win over the new Prime Minister) and Morrison’s own professed faith … explain why this seemingly unimportant issue cannot simply be shut down by the Prime Minister. The bottom line for me was that at first I thought ScoMo was an amiable enough fellow, somewhat empty headed but essentially harmless. Now it seems he can be genuinely nasty and dangerous. In other news from the Betoota Advocate, the Liberal Party base has been discovered. It’s four old white people bickering in a local cafe. The CSIRO were in town to record bird numbers and stumbled upon them. In some later wash-up from Victoria, the Greens now claim they can’t lose in Brunswick. Once a working class, inner, poorer locale. Now hipster ville, with proletarian remnants; overlaps with “The Peoples Republic of Moreland”. 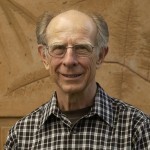 For an accurate portrayal, see the Murray Whelan novels. Greens had been hoping for success there. …… for several elections. My post-election claim that the Greens had lost plenty of ground may need revising in the light of, ummmmm, facts. I wonder how much longer the COALition can continue to ignore the warnings? Last a bit longer, too! *quip shamelessly borrowed from Brian’s latest post. Have you seen better Cabinets at IKEA, Geoff Miell? The IKEA cabinets last longer than the Federal Cabinets! Speaking after a renewable energy conference in Sydney on Tuesday, Mr Turnbull said the National Energy Guarantee – a policy developed then dumped by his government before being adopted by Labor – was the best way to create investment certainty in the electricity sector. While we contemplate PM Morrison’s first pre-selection, may I be permitted to have the poor taste to savour the first pre-selection of Brilliant PM Turnbull? Perhaps it has flown under the radar, but that was the first time I recall hearing of Liberal Party branch-stacking. In Queen Victoria’s State, we were accustomed to believing it was a Labor Party sin. Thus Tony A was stuck, while Malcolm T sank the slipper into one of “the insurgents”. It’s starting to look like that Old Testament legend, of Samson wrecking the joint in his blind rage. Malcolm doesn’t care for “revenge as a dish served cold”. Straight out of the oven, scalding hot, will suit him just fine. Why didn’t Mr T show that style of courage, sharpness and wit as PM? Oh yes, he gave himself a one-seat majority by being a lacklustre campaigner, putting forward policies rejected by thousands of voters. Arithmetic rules, OK? Anecdotally, Turnbull was disliked by traditional conservatives because he isn’t one and held their nose in 2016. There seems a better feeling around the traps for ScoMo. Nice to see you paraphrasing Angry Gough, Mr J!! There seems a better feeling around the traps for ScoMo. Then why can nothing save the lower house? Surely a real conservative like Morrison will appeal to the voters that the mountebank Turnbull alienated. Why didn’t Mr T show that style of courage, sharpness and wit as PM? The Coalition Agreement for starters, which we were never allowed to see, precluded action on climate change. Or so it was said. Barnaby Joyce had him by the short and curlies, and I think the resentment showed, when Barnaby stumbled. When you have a party that gets less than 4% of votes blocking climate action, the country has a problem. More than a dozen of Australia’s largest mining and infrastructure companies may be in breach of their legal duties by refusing to consider the financial risks posed by climate change, an investor action group says. In September, the Australian Securities and Investments Commission published a report that said “the law requires” relevant companies to “include a discussion of climate risk” in their annual report. I wonder whether the toothless ASIC will grow some teeth and start prosecuting? …..is worth saying out loud and often. Now Morrison has acted to lock in his control of the party while on the same week end un-democratically protecting one of the vilest of the LNP denialists (along with Abbott) who would have been ousted in the public interest. And so Morrison makes it personal with me. I am offended by this know nothing arrogant chauvinist idiot of a politician. I look forward to hearing the sound of his lopped off political future rolling down the road …Duncitty..dunce..dunce..dunce..done! I can see the sense of a party requiring 60% of party room vote to have a spill during a parliamentary term. However, it also makes sense for an automatic spill to occur if a party loses an election. Scomo seems to be reacting before thinking things through. When Morrison wheeled this back he only went as far as Abbott’s ousting,…very disingenuously and conveniently forgetting Abbott’s spill of TurnBull in the first place in the time of Rudd. And yes, he hasn’t thought through the ramifications. I think he seriously expects to be elected as a prime minister. But it is the over riding of the preselection process that is the crime against democracy here. Morrison claims to be the ultimate arbiter of who will be elected next year. With a little bit of luck all four of the losers he was protecting will lose at the poll, especially Abbott. Yes also to the automatic election loss spill. In far off “more gentlemanly days”, or when politicians were expected to take responsibility for their actions (as Mr Turnbull urges on the leaders of ‘the insurgency…..’..) it was assumed that if you led your Party to an election defeat, the leadership would automatically become vacant immediately thereafter. The unsuccessful leader might then be re-elected, but at least the Party room had a say in it. I’m thinking of Opposition Leader Whitlam after his election loss on 1977, for example. Some commentators decry Mr Turnbull as vengeful, vicious and unhelpful. He points out that he is no longer in Parlt and has a right to express views. When he lists the insurgent leaders: Dutton, Abbott, Greg Hunt et al as he does regularly, I think he’s suggesting that any voter who regrets Mr Turnbull’s removal, and lives in an insurgent’s electorate, might consider voting ABAI (Anyone But An Insurgent). Mr Rudd waged a sly, careful war against Ms Gillard. Mr Abbott promised not to snipe and fulfilled the promise by using heavy artillery at all times, never a sneaky rifle. Mr Turnbull is Doing It His Way. I am offended by this know nothing arrogant chauvinist idiot of a politician. BilB, the first time someone mentioned climate change to ScoMo he admitted that he’d never thought about it. In some ways Turnbull was worse, because he knew he was spouting rubbish, especially about renewables, SA and that ruddy great storm. For the same reason, you can never take Frydenberg at face value about anything. Now I’m wondering if that foolish Frydenberg fuss over the small South Australian storm, all the hyperventilating and “reliable energy” guff, exposed here time and again as arrant nonsense, was actually aimed at the National Party Rump/Liberal Climate Dinosaurs, in an attempt to drag them into the 20th century, and persuade them that something like the NEG was their only hope as a faltering Coalition??? Trying to talk to them over their street barricades, via the voters?? Or is that too cunning a plan to have been hatched by Greg Hunt, Malcolm Turnbull and Minister Josh? We await Mr Turnbull’s memoirs. Meanwhile The Oz claims Mr Laundy has asked Mr Turnbull to STFU. Turnbull is looking the happiest he has been for yonks. Maybe he is more suited to commentating than the hard graft of making things happen. He needs to be careful though. Some commentators think Craig Kelly’s survival was the result of Turnbull saying he should be got rid of. I wonder whether Mr T couldn’t care less about being careful? Perhaps he has borrowed something from “The Insurgents”TM , a desire to blow the government up? You never know, he may become a more effective wrecker than Mr Abbott.